Special thanks to Kurau Seafood Soup for extending this food review invitation. Kurau Seafood Soup (古楼海鲜粉) at Kota Permai, Bukit Mertajam is the descendant of the original stall in Kuala Kurau, Perak. This family business traces its roots to 1949, when the current proprietor's maternal grandfather opened a roadside stall in the small fishing village. Departing from the common practice of using pork bones, Kurau Seafood Soup prepares broth from fish. This results in a soup which is rich in "fresh" taste (鲜味). Quite surprisingly, the restaurant uses the same broth to prepare all dishes. Each dish attains a unique taste by infusion from other seafood ingredients. It is vital to note that the restaurant does not use MSG in food preparation. Kurau Seafood Soup Ramen (古楼海鲜汤拉面, RM8.90) is the restaurant's signature dish. Using the basic fish broth, the soup is further flavored by shrimps, stingray (魟鱼) and cuttlefish (墨鱼) - all seasoned with sweet-spicy sauce. A few fish balls are also thrown into the mix. Unlike the original version which uses koay tiao (粿条), bihun (米粉) and mee (面), this dish uses ramen (拉面) instead. The noodle's springy texture is a hallmark of its freshness. Ramen is made by hand every two days to maintain freshness. Overall, I cannot recommend this signature dish highly enough. Kurau Dried Spicy Seafood Ramen (古楼干捞香辣海鲜拉面, RM9.50) is the dry version of the previous dish. The savoriness of fried spicy cuttlefish is more pronounced in this form. Also contributing to taste is crispy prawn chili sauce (脆虾米辣酱) which produces fiery sensation on the tongue. For this dry version, soup is served in a separate bowl. Soup ingredients are similar: fried spicy shrimps, stingray and fish balls. However, the strong flavor of cuttlefish is notably absent. Hakka Rou Sui Yan Cai Ramen (客家肉碎腌菜干捞拉面, RM9.50) is yet another ramen dish, but is inspired by elements of Hakka cuisine (客家菜). 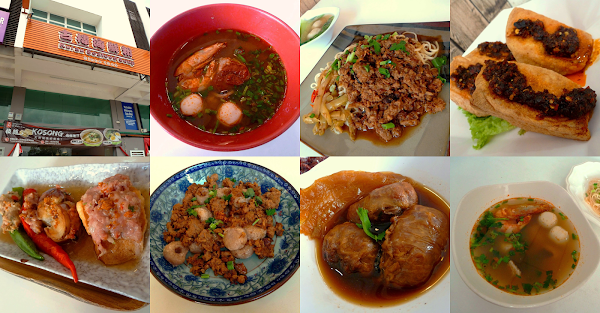 What I find most appealing is the generous amount of minced pork (肉碎) with wood ear fungus (黑木耳). The noodle is also served with pickled mustard (榨菜) to produce a sharp taste. The accompanying soup is substantially milder than the previous ones. Served with the soup are Fuzhou fish balls (福州鱼丸) and bok choy (小白菜). The former is made from a mixture of fish and pork. Coriander and scallion serve as garnish. Hakka Suan Pan Zi (客家算盘子, RM6.50) is one of the most iconic Hakka dishes. Made from taro and tapioca flour, these "beads" are stir-fried with minced pork. The beads have chewy texture reminiscent of mochi (麻糬). Hakka Fried Yong Tau Fu (客家香煎酿豆腐, RM6.50) is another well-known Hakka delicacy. Minced pork is stuffed into tofu and vegetables like eggplant (brinjal), red chili pepper and okra (lady's finger). This snack is quite tasty and is highly recommended. Moving on, Hakka Steamed Dried Oyster With Minced Pork (客家香焖蚝干肉碎, RM6.50) is made from a mixture of minced pork and dried oyster, which is then wrapped in pig's caul fat (猪网油). This juicy treat is then stewed with pickled mustard. The Chinese mustard is hardly salty because it has exchanged flavors with the stew. The final dish is Crispy & Spicy Dried Shrimp On Fried Bean Curd (RM4.50). The 4 pieces of tofu are deep-fried to golden perfection, and then stuffed with crispy prawn chili. This snack is best consumed while it is warm. As tofu cools, it loses its characteristic crispiness. Moving on to drinks, Homemade Herbal Tea (自煮凉茶, RM1.80) uses a herbal recipe that has been inherited down the family line. In line with the proprietor's philosophy of only selling healthy drinks, the amount of sugar is kept minimal. Unlike most restaurants in its category, Kurau Seafood Soup prepares matcha from actual tea leaves. Ground by hand, the matcha's grassy aroma is soothing to the nose. Shown here are two ways to enjoy matcha: Hot Matcha (抹茶, RM2.50) and Matcha Latte (拿铁抹茶, RM7.90). Both are recommended for matcha lovers. Directions: From Pusat Perniagaan Gemilang, drive westward along Jalan Song Ban Kheng towards Pusat Perniagaan Maju Utama. After the Caltex gas station, turn right at the next traffic lights. Shortly after, Kurau Seafood Soup is one of the shops on the right.